Prince Harry and Meghan Markle are to visit Edinburgh on their first official joint visit to Scotland next week. The royal couple will visit a social enterprise cafe on Tuesday and help to mark the Scottish Year of Young People 2018. 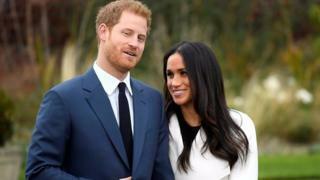 Kensington Palace said the couple would be meeting members of the public and learn more about organisations that work in the local community. Their first stop will be at the Esplanade in front of Edinburgh Castle. They will be officially welcomed to the city by the Royal Marines Scotland Band and then watch the One O'clock Gun being fired inside the castle. Prince Harry became Colonel-in-Chief of the Royal Marines in December 2017. The couple will then move on to the New Town to visit Social Bite, a social enterprise cafe which distributes 100,000 items of food and hot drinks to homeless people across Scotland each year, as well as employing staff who have experienced homelessness themselves. In the cafe, Harry and Ms Markle will learn more about the social enterprise, meet staff and tour the kitchen. They will be the latest in a string of high-profile visitors to Social Bite premises. Hollywood star Leonardo DiCaprio stopped for lunch at Social Bite venture Home in Edinburgh's west end in November 2016 while the Duchess of Cornwall and George Clooney have been to Social Bite's Rose Street branch. Prince Harry and Ms Markle will round off their visit by attending a reception at the Palace of Holyroodhouse to celebrate youth achievements marking Scotland's Year of Young People, an initiative that aims to inspire Scotland through its young people. Youth representatives from various charities and organisations that work with and for young people across the country will be present, and the reception will provide an opportunity for them to talk about their aspirations for the year and the activities that they have been involved in so far.